INGREDIENTS: calcium carbonate.sorbitol.Aqua.Glycerine.silica mfill. Cellulose.potassium nitrate. Sodium. Mono fluoro phosphate. Zinc citrate.phosphate.neem oil. 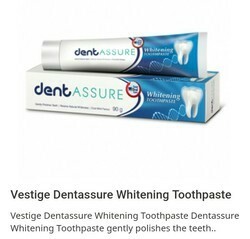 Dentassure Toothpaste has a unique formula and comes with the dual protection of Neem and Clove that fights germs and prevents dental cavities. It acts as anti gingivitis. It also has Calcium that strengthens the teeth. Use Dentassure Toothpaste daily for fresh breath and sparkling teeth. Dentassure Toothpaste is a unique formula and comes with the dual protection of Neem and Clove that fights germs and prevents dental cavities. It also supports gum health and stronger teeth. It contains calcium that strengthens the teeth. Use it daily for fresh breath and sparkling teeth.